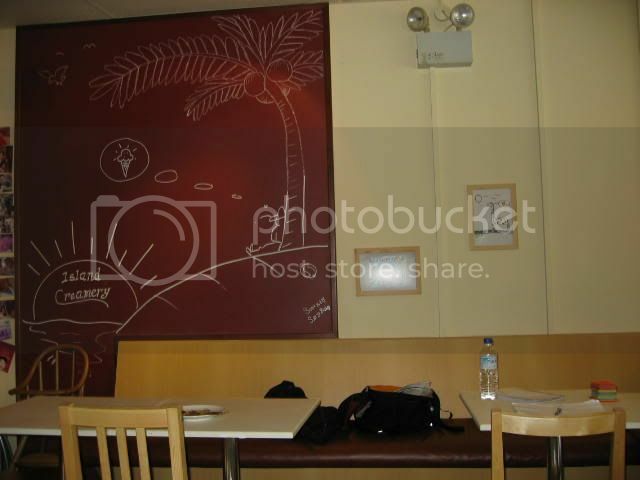 We decided to stay within Cititel Mid Valley Mall on our final morning, so we roamed the mall looking for some breakfast. I'm a sucker for doughnuts, so I had to stop by Dunkin' Doughnuts with their multi-coloured sweet rings for a little mid-morning sugar rush. 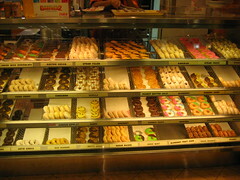 Had a chocolate-filled doughnut that was sweet and sinful and kept me very happy. 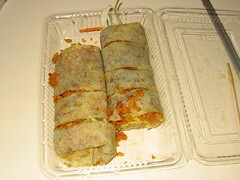 We saw this popiah shop on our first day, so we decided to have some for our breakfast. It's supposed to be a 'crispy popiah', thanks to a generous helping of roasted peanuts and what I think was toasted crumbs. So it certainly was quite crispy, but I thought they were a bit heavy on the sweet sauce. 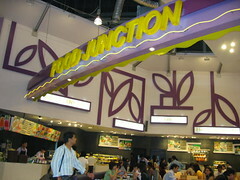 Unfortunately, breakfast was much more interesting than lunch, since we decided to eat at the local food court, coincidentally named "Food Junction", much like the similarly-named chain here. 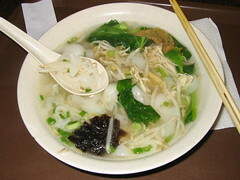 Similar food too - I had a bowl of Penang Kway Teow in clear soup, which wasn't as good as the one I had had the night before. Other offerings included claypot rice and fried Penang kway teow, which weren't all that impressive - a fairly insipid ending to our eating journey in KL. We decided to go exploring by ourselves on Day Two. A short taxi ride brought us to Sentral Station, where we found breakfast at an unremarkable Indian coffee shop by the side of the road. 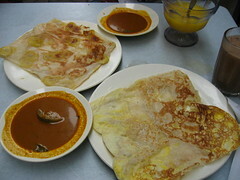 We saw at once that they served something familiar to Singaporeans: roti prata. I have a theory that the best food a country can offer is generally found off the streets, not in any swanky restaurant or air-conditioned eatery. We faced a slight language problem when we discovered our Indian shopowners didn't speak any English. 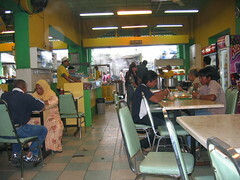 Now, if you ask for roti prata in KL, you're not going to get any. Although it's the same thing, over there it's known as roti chennai; something my friend discovered the hard way. After some linguistic struggling and verbal grasping at straws, we eventually managed to order a roti pisang (banana prata) and a roti telur (egg prata). 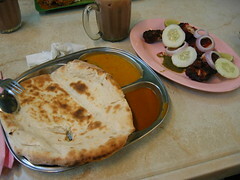 I must say that the Malaysian roti chennai is much better than the Singaporean roti prata. Crispy and flaky, there is not a hint of the limpness and sogginess that so often disappoints when tucking into a roti prata here. Fresh and hot, the roti pisang and roti telur almost crackled as we attacked them. The sweet, caramelised banana slices and puffy egg were all we needed to whet our breakfast appetites. 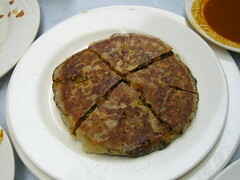 We also decided to try a chicken murtabak on the stall-owner's suggestion ("bagus!" thumbs-up), and were surprised to find that it was very different from what we're used to in Singapore. The Malaysian version is almost like stuffed pita, with an interesting stuffing of diced chicken and what might have been chickpeas, though I can't be sure. I'm not sure if I'm all that fond of it, but it was certainly unusual. 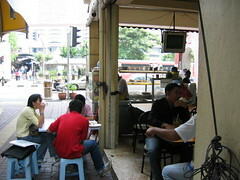 Lunch was at another Indian eatery opposite KL's Central Market (a tourist trap if ever there was one). It wasn't till after I'd ordered that I realised the only other people eating Naan were two Caucasian tourists. Sure enough, my naan was huge, and extremely doughy. I couldn't finish the whole thing, but made a valiant effort. The tandoori chicken was strangely spicy, perhaps something to do with the chilli oil the chicken is infused with. Most of the other diners had dishes that looked something like this, rice with assorted vegetables and meat. I recognised beef rendang, mutton and fried chicken. Something fairly similar to our own chye png stalls, I imagine. Since most of our evening was spent bargain-hunting at Petaling Street, it went without saying that dinner had to be somewhere in the vicinity, especially as Chinatown was littered with roadside stalls emitting really amazing aromas. 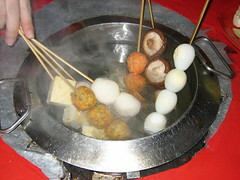 When I first had lok-lok, or what some rather pretentiously term 'Chinese fondue', I mistakenly thought I was looking at satay gone wrong. 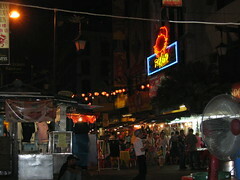 While I know better now, it's still not the best thing I've eaten, so it's lucky that in addition to the lok-lok we had for dinner, there were a few other stalls selling other kinds of food. It is said that good things come in small packages, but I was still a bit disappointed at the size of my bowl of Ipoh Hor Fun. However, I was immediately heartened when I took my first slurp. 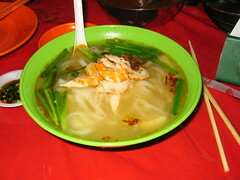 There is just something so ethereally silky about the smoothness of Malaysian hor fun noodles, and the sweetness of the broth, that one bowl is rarely enough. Immensely satisfied with our dinner (and our shopping), we went to bed on full stomachs, ready for the following day, our last in KL. No updates because I was in KL over the weekend for a shopping and eating trip. Very fruitful in terms of eating, and fairly successful in terms of shopping, given that I am not a girl and cannot be expected to shop like one. We arrived at about 4pm and proceeded to have our first meal, being somewhat peckish from the journey. 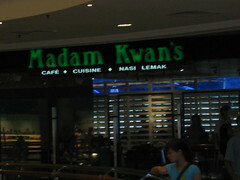 On Pineapple Malibu's recommendation, I decided to check out Madam Kwan's, apparently an eatery famous for its Nasi Lemak and Nasi Bojari. Although Pineapple Malibu recommended the one in KLCC, there was another outlet in Mid Valley Mall, conveniently next to my hotel, so that's the one we went to. 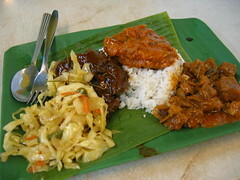 I had the Nasi Bojari, which I believe is unique to Malaysia. 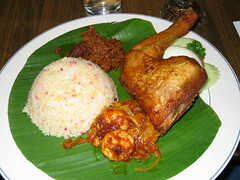 Aromatic rice served with a big fried chicken wing, some beef rendang and additional spicy belachan and shrimp. I wasn't that impressed with this dish, as the rice wasn't particularly aromatic (you'd do better with nasi lemak), and the beef in the rendang was so torn you could barely recognise or taste it as beef. 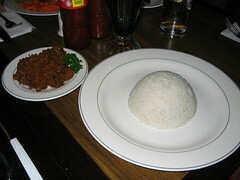 Chermain had the beef rendang as a whole meal, with some nice coconut rice. 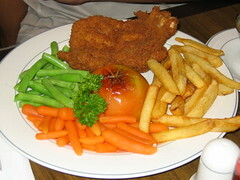 Wai Kit had something a bit more Occidental: chicken chop. Why would you go to KL and order chicken chop? I hope it was good, at least. 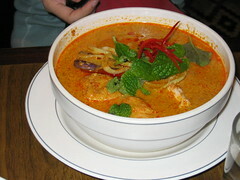 Wan Jun ordered a bowl of laksa, which looked and smelled really fabulous, even though I never really developed a liking for it. 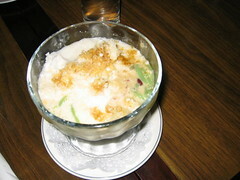 Dessert was a shared bowl of cendol, and seriously there is no cendol in Singapore that can match Malaysia's. The gula melaka and the coconut milk are added in loving amounts, sinfully sweet but just short of cloying and sticky, and the texture of the red beans and green worms; rough and smooth, contrasting the shaved ice...delicious. 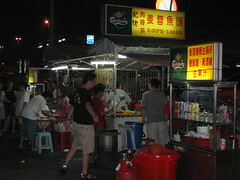 My cousin and her husband were nice enough to bring us out to dinner at a roadside stall run by his ex-colleague. The best thing about KL is that you can literally be located in the middle of nowhere, outside a decrepit old building, but people will still come and eat your food. 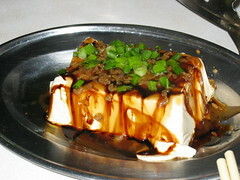 Our first dish was pretty normal - tofu with soya sauce and chopped chives. The only interesting thing was that the tofu was chilled, apparently not all that common, even in Malaysia. 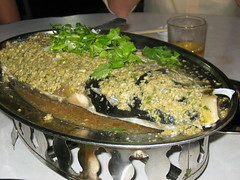 Next, some sort of river fish, steamed with lots and lots of garlic. Didn't really have a lot of this, since I'm not much of a fish person, and it was quite a bony fish. Still good though. 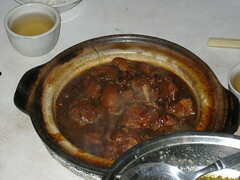 A steaming claypot bowl of braised pork wafted very nice smells around the table. 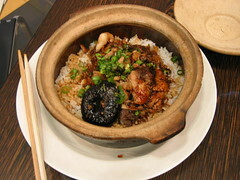 Fatty and oleaginous, the pork has been simmered away in black sauce, breaking down the high gelatin content and rendering the pork soft and flavourful. Bak Kut Teh needs almost no introduction. 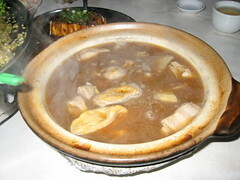 Pork ribs simmered in an herbal broth comprising various spices, peppercorns and garlic. 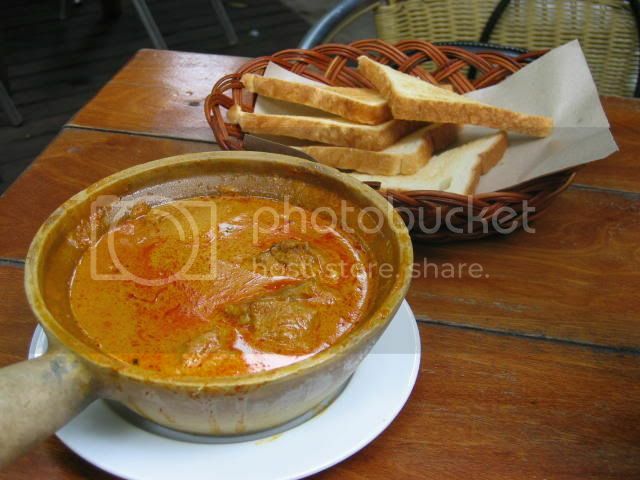 Malaysian bak kut teh tends to be less peppery and more herbal than the Singaporean variety. The one I had used rather lean meat, which was a shame, and included less appetising bits of kidney and other offal. We began and ended our first day in KL with some good food, and we all felt rather stuffed by the time we returned to our hotel room, happy that our food journey was off to such a good start. I stumbled upon this casual eating house after a second unsuccessful attempt at trying to get a meal at PS cafe. That place doesn't seem to open for lunch at all. Thankfully, I happened to notice this interesting place tucked among the trees, looking like a rainforest cafe, something that appeals to the naturalist in me. Since I was in the area anyway, it made sense to try it out; who knows, it might turn out to have been a serendipitous discovery. 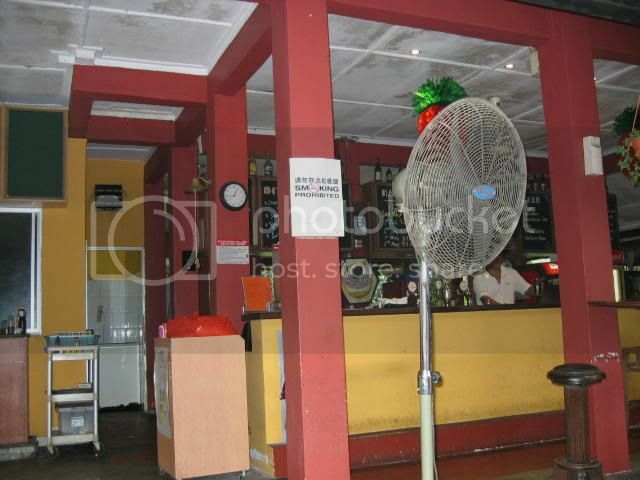 Dempsey's Hut is one of those old-looking colonial bars with its own football team and charming expatriate history. Unlike the venerable Colbar though, Dempsey's Hut, does not seem to have gone through quite as many tribulations, nor does it seem to have the former's fervent support from kids from the international school nearby, or even the loyal old-timers. As you can well imagine, there is no air-conditioning whatsoever, in keeping with the au naturel feel of Dempsey's Hut. However, this might of course pose a problem during those warm, humid Singapore afternoons, even with the shade of the massive rambutan tree above. Dempsy's Hut is a restaurant and bar, so even if you don't come here for food, you can come sample some of their drinks - it's an interesting alternative to chugging alcohol at smokey and crowded venues like the pubs at Holland Village. The Hut even has designated smoking areas, so you don't get cigarette smoke in your face the whole time. 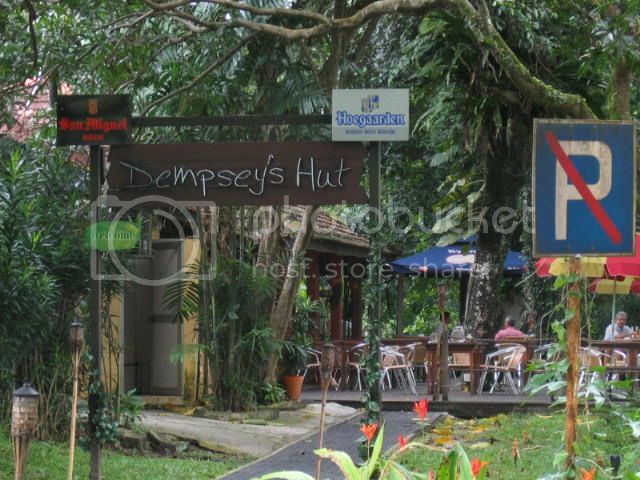 There is definitely a lot of greenery at Dempsey's Hut. This is good for nature-lovers, but bad for people who get jumpy around insects and seedpods. Although the two cans of insect repellent displayed near the bar are somewhat disquieting, I had no need of them throughout lunch. Dempsey's Hut serves mostly western food like steaks and hot dogs, but they also do a few local dishes like chicken curry ($9.50), which is slightly more expensive than the one at Colbar, but I was astonished to see it served in a claypot, not something I'd have expected even from a hawker centre. I was also pleased to note that they were very generous with the chicken, and even threw in a potato to give you your money's worth. The "juicy beef burger supreme" was cheaper than what you get at most places at $11.50, but unfortunately this time was less generous than usual. 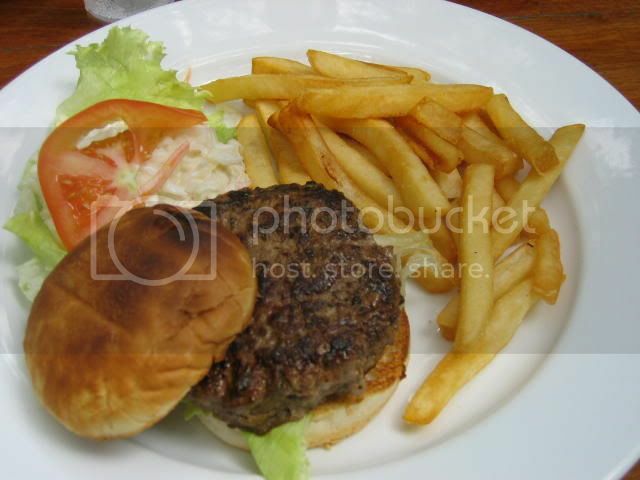 The burger was rather dimunitive, but in terms of taste was pretty good. The patty was certainly juicy, so I suppose it only lived up to half its name. 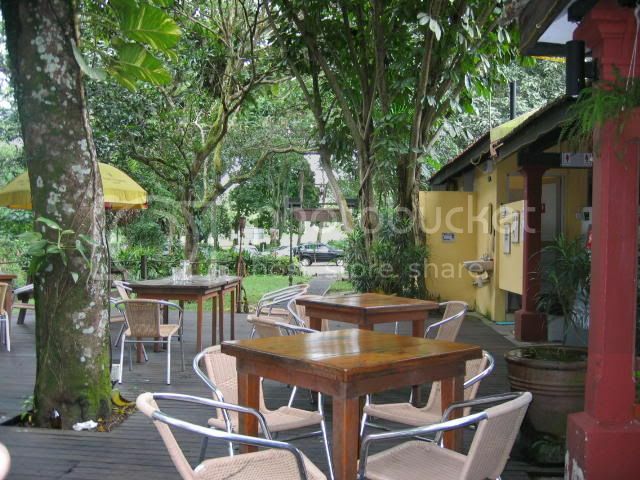 All in all quite an interesting place, worth a visit if you like exploring a quiet meal amidst leaves and dappled sunlight. Overall: Off the beaten track, both literally and metaphorically. Ile Flottantes, literally floating islands, are baked meringues floating on pools of creme anglaise, flavoured with almond flakes and caramel. 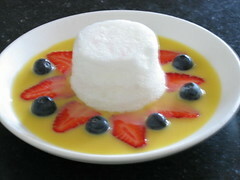 Apparently in the UK, floating islands involve poached meringues, but in France those are known as oeufs à la niege. I first had this dessert at Sebastien's, a bit of a risk, since I don't really like egg whites. But I was blown away by the feather-light meringue; it was almost like eating sweetened clouds. 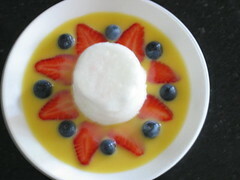 It became my new favourite dessert (it's also low fat and cholestrol and high-protein), a light way to end a heavy meal. I also became quite obsessed with reproducing it at home, but without much success as I couldn't find a reliable way of making baked meringues. Eventually though, I managed to stumble my way onto a fairly decent recipe, itself adapted from a Martha Stewart recipe. You could use the aforementioned caramel and almond flakes in place of the fruits, but I prefer the slight tang of the berries to offset the sweetness of the meringue and sauce. 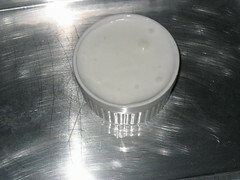 Preheat the oven to 120°C, and butter two ramekins. 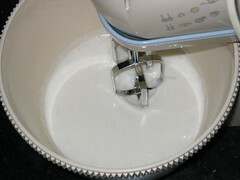 Central to the success of any meringue is the beating of the egg whites. I am told there are many tricks to achieve properly stiffly beaten whites. The ones I find most useful are to use day-old, room-temperature whites (store them in the fridge for a day), and use a really powerful KitchenAid mixer. Failing which, try to beat the whites at an angle to incorporate more air into them, rather than letting the beaters go around horizontally (as you see here). This is especially helpful if you're only beating a small quantity of egg whites. 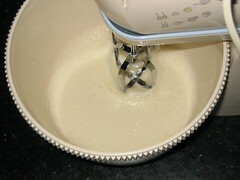 ...and beating, until the egg whites form stiff peaks. Using a spatula, fill the pre-buttered ramekins with egg whites. Tap the ramekins to ensure that there are no air-pockets. They should just reach the rim of the ramekins. Use your spatula to level off the top. Place the ramekins into a baking tray, and pour hot water to come half-way up the ramekins. 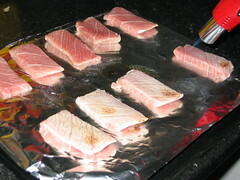 Pop them into the oven and bake for forty minutes. They should rise evenly, and at the end of forty minutes, the tops should still be white and smooth (not sticky) to the touch. If in doubt, bake for another five minutes. Turn the oven off and leave the door slightly ajar, and let the meringues cool down in the oven for half an hour. 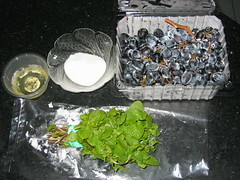 Subsequently, transfer them to the refrigerator to chill for another half an hour. I suppose if you're pressed for time you could remove them straight from the oven to the refrigerator, but I prefer it this way. 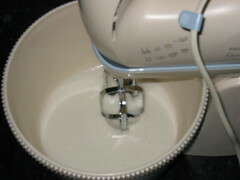 When you're ready to unmould the meringues, remove them from the refrigerator. They should have shrunk in the ramekins, leaving a gap on one side. 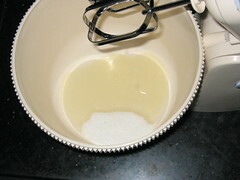 Tilt the ramekins, allowing the liquid egg whites to drain off through this gap. Pour the chilled creme anglaise onto a plate and unmould the meringue onto it, wiping off any excess liquid that is clinging to your meringue. Slice the strawberry and lay the slices around the meringue in a rosette, and drop the blueberries in between the strawberry slices. Ice cream parlours are all the rage these days, with many boasting their own creative flavours. The Daily Scoop, Eskimo and Wild Hisbiscus are some names that spring to mind. But surely the pioneer must have been Island Creamery, with the Tiger Beer and Ginger ice creams that set tongues wagging all across town. Previously occupying only a small corner of Serene Centre, doing mostly takeaways, Island Creamery has now expanded considerably and has become a place for young people to congregate. In the day, students drop by after school, and at night, friends come to relax and enjoy a nice cool ice cream. Unfortunately, Island Creamery doesn't seem to make such funky flavours, sticking to more reliable tastes like Teh Tarik, Coconut and Reverso (Chocolate and oreo). They serve other things like banana splits and shakes, but most people come for the ice cream. It is said that they also come for the pretty girls behind the counter, but this is of course hearsay. A single scoop of ice cream will set you back $3.50, which is quite a fair bit. So far I've tried the coconut and reverso flavours, and found both to be quite agreeable. Island Creamery makes their ice cream quite thick, which does cause it to stick a bit to your throat, so it's best to wash it all down with the cups of water they provide. The reverso, in particular, with chunks of crumbly oreo cookies, is likely to cause sore throats in large quantities. Island Creamery still runs a pretty successful retail business, selling their ice creams in nice white tubs, as well as other sweet things like baked alaskas and ice cream cakes. Another thing that makes this place popular with young people is its friendliness. 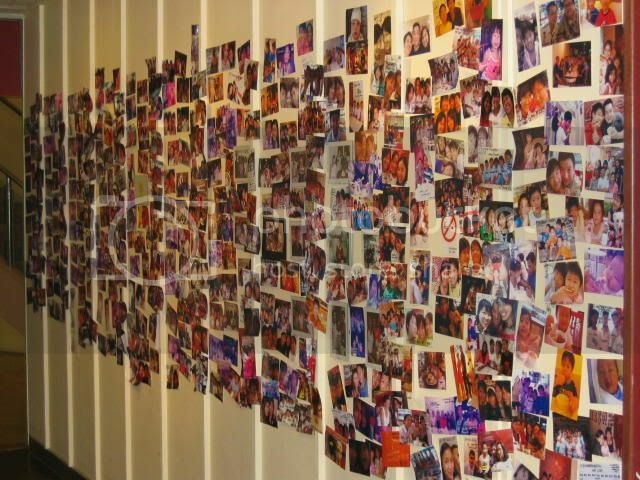 There is a Wall of Fame feature that is absolutely plastered with photos. In fact, you're encouraged to take a picture using a digital camera suspended from the ceiling. So if you're in the mood for some ice cream after lunch or dinner, or a place to relax, Island Creamery is definitely a venue to consider. I'm always on the lookout for places to eat when you're on a budget. I know this is a rather pointless exercise, considering the plenitude of hawker centres and food courts dotting this island. 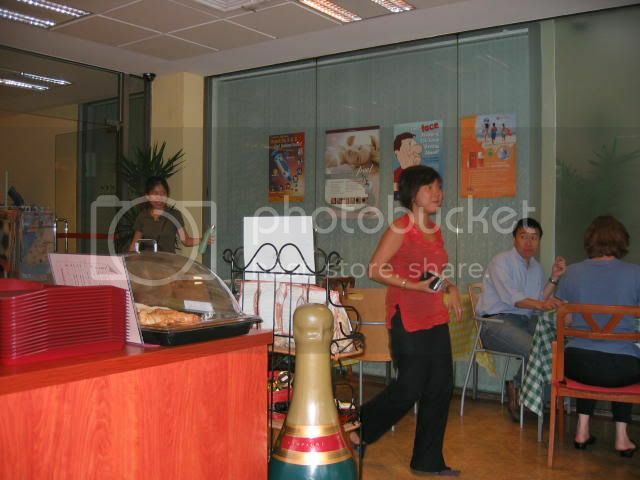 Still, there are occasions where you don't feel like jostling with a sea of other diners and queuing for seats and food. So while reading I-S magazine the other day, I was intrigued to find a review of La Petite Cuisine, a little French bistro set up in Serene Centre, serving food on the cheap. It occupies the spot Island Creamery used to operate out of, before they expanded and took up a few more shop spaces. 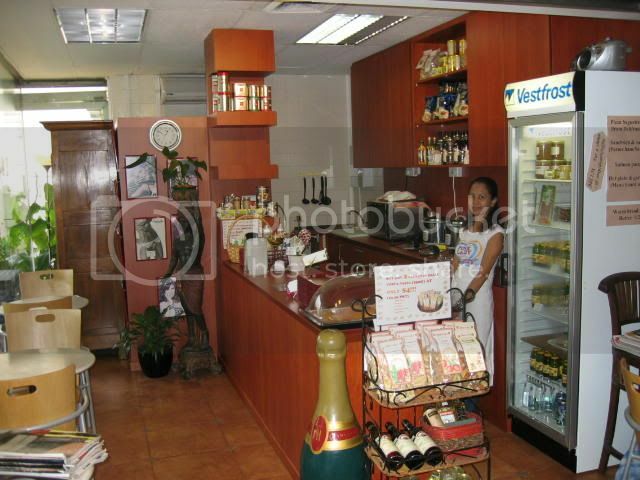 La Petite Cuisine really is petite, able to accomodate at most ten people. To leave you no doubt that it is a French establishment, the lady at the counter cheerfully calls out "Bonjour!" to you as you walk past. There is no menu, merely a chalkboard listing the offerings for the day. Most are within the range of $8 - $12, and range from cassoulet to steak. An additional $1.50 ensures that you get to choose dessert and coffee. As this is such a small setup, La Petite Cuisine only accepts cash, a fact I was not aware of, resulting in a ten minute walk to the nearest ATM at Coronation Plaza. Also, they have a very inefficient method of taking orders, as you place each order at the counter (meaning you have to queue for your food, something I'd been hoping to avoid). You even pour your own water. One of the cardinal rules of eating out is always order the type of food the restaurant was opened to serve. That means not ordering the foie gras at an Italian restaurant, and staying away from tiramisu at a French place. 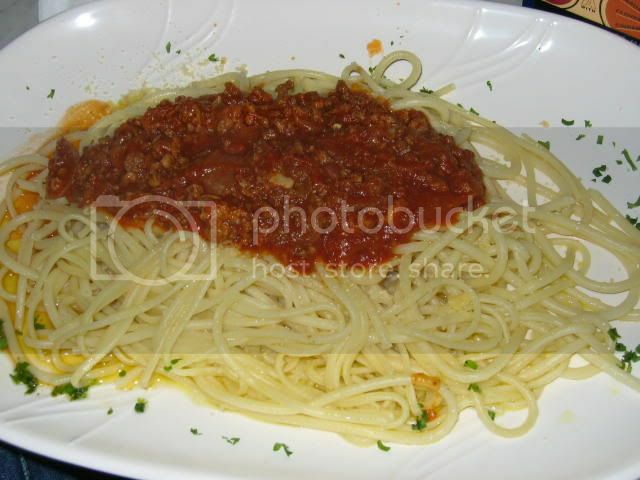 I forgot this and went for the spaghetti ($8), which was a bit mushy from being overcooked, with only a small helping of bolognaise sauce, in keeping with the general small portions served. I suppose that's how they keep costs down. At about 3pm, the chef himself had lunch at the restaurant, a rumbling Frenchman who inquired if there were any problems, whereupon, being told there were none, informed us he would have ignored them anyway. French humour. Overall: You'd do better with the French food, but good place for a quick cheap lunch to catch up with newspapers. To celebrate my mother's birthday this year, my sister and I (mainly my sister, I only contributed a starter) cooked dinner for our family over the weekend. Recipes won't be provided, since most of them are varaitions of familiar themes found elsewhere on this blog. 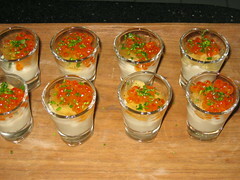 The amuse-bouche was a shot of cauliflower puree topped with dashi jelly and ikura roe. The saltiness of the roe was offset by the bland cauliflower puree, though I didn't really taste the dashi jelly. 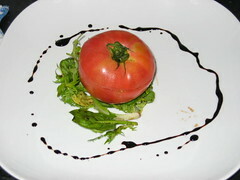 The first starter was a dish of Japanese Momotaro tomatoes stuffed with aubergine caviar and served on a bed of mixed salad dressed with a simple vinaigrette. These Japanese tomatoes are extremely sweet and go a long way to making any dish a success. Note to self: next time don't waste so much balsamic vinegar when drizzling. 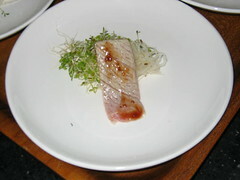 In order to produce the second starter: seared tuna belly served with fig jam and daikon cress. Next up was a pumpkin and crabmeat bisque. 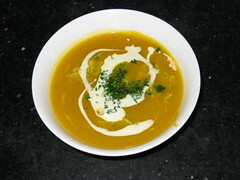 A very sweet soup, as the pumpkin was complemented by a generous helping of sweet crabmeat. 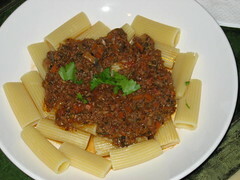 Our main course was rigatoni a la bolognese, using minced lamb in place of the usual beef, which resulted in a more robust ragout. The pasta was slightly overcooked, which tends to happen when cooking in large quantities, but it wasn't really a problem. All in all a superb dinner, probably better and cheaper than eating out.